I’m not going to lie… this… what you see below (see image)… took a ton of work. A lot of research. And when I heard the intro of my first episode being played through iTunes on my Macbook, I got giddy and made little girlie noises out loud, along with some fist-pumps. I really hope you get value from it. 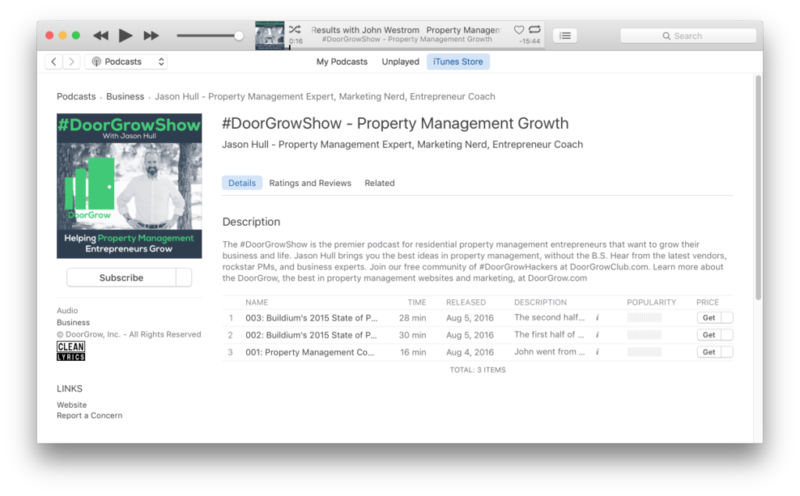 I know I’m not the first to create a Property Management Podcast, but I do aim to be the best. Well… I had a radio show in college called the People Guy Show, which I thought was incredibly fun (even though only a few friends tuned in). I would get them to call in and pretend to be different people. I was supposed to just play music like a DJ, but that was too boring for crazy me. I dreamed of one day having a fun show connecting with others. Anyhow, I also figured I could do it well… I mean, that is basically what I do every day is talk to people and ask them questions. That is how I became an expert in the space of property management. I got to work with the best on websites and marketing and ask the questions that matter regarding their business. I’ve helped generate millions in ROI, but very few people have heard of OpenPotion, GatherKudos, or DoorGrow. DoorGrow just launched a year ago in November and is already the top link on Google for Property Management Website Design, and the 2nd link for Property Management Websites. I want to reach more people, help more people, and I want people to get to know me. I’ve noticed people have strong walls and barriers. They don’t trust outright. Trust is earned. Trust comes from knowing people that are worth trusting – I just need people to get to know me. How better to get to know me than by doing video and audio of myself. I have already been recording live video interviews. Podcasts were the natural next step and another channel to repurpose my content. Not everyone has time to sit and watch videos, but audio you can take anywhere that you have a phone (and some headphones or a car). So please subscribe and do me a huge favor and rate me on iTunes with a real rating. It would mean the world to me and help me get noticed and found by others. Also be sure to pass it around – sharing is caring. If you would like to be on the show please learn more here & grab a time for our interview. I enjoy talking with people, but even more, I enjoy getting results with people. So that is why I started my first episodes with one of my coaching clients, John Westrom. Thanks John – your trust in me made me a better coach and allowed us both to shine. 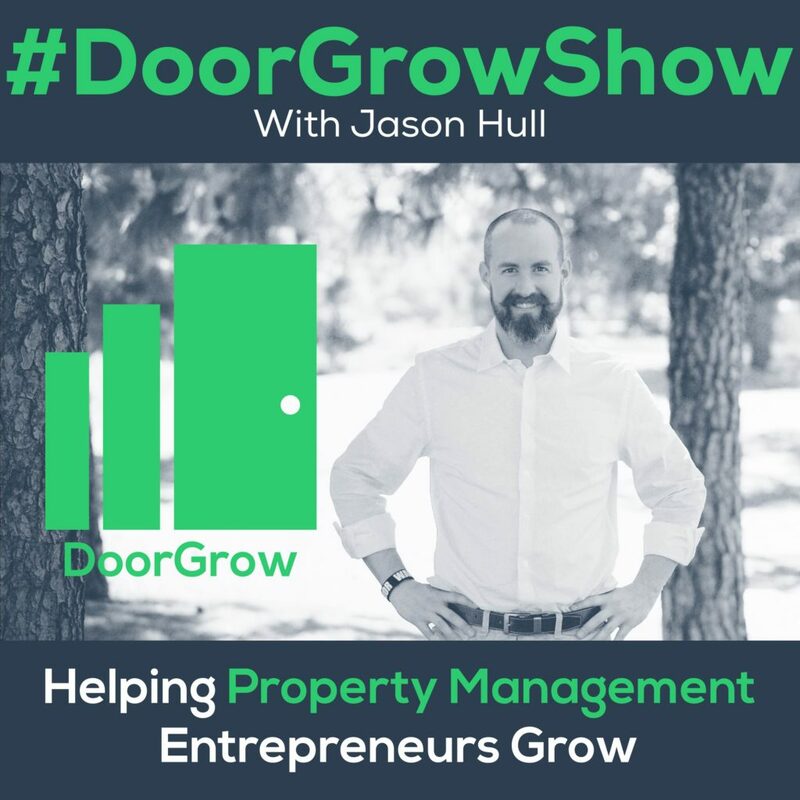 Be sure to have a listen… I’m sure the #DoorGrowShow will get better as I get more experienced. Thanks for helping me fulfill a dream. I ran across your podcast and loved it. We would be interested in becoming a sponsor. Could you send me some of the shows metrics and pricing for sponsiorships. Our company developed a property management software called PropertyZar. Your podcasts would be a perfect audience.